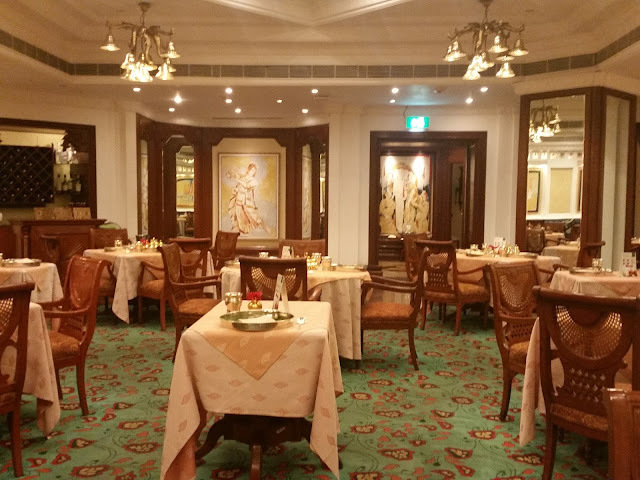 Dakshin, the South Indian restaurant of ITC Kakatiya is known for its delectable South Indian fare. Apart from offering delicacies from the states of South India, the restaurant also organizes food festivals showcasing the cuisine from a particular region. 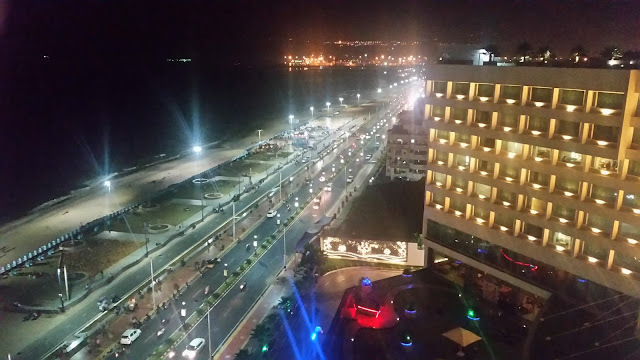 In September, a Mangalorean Food Festival is on here, offering the flavours of this region of coastal Karnataka. Sous Chef Lakshit Shetty of ITC Kakatiya is of Mangalorean descent, and hence this festival is very close to his heart. Though he was already proficient in this cuisine, he took special care to cull out authentic recipes from his family and other Mangalorean homes, work on them and present them here. As a result a delightful array of special items form part of the a la carte menu for the festival, which are in addition to the usual offerings at Dakshin. Invited for a preview and interaction with the chef, we settled down with a glass of tender coconut water. 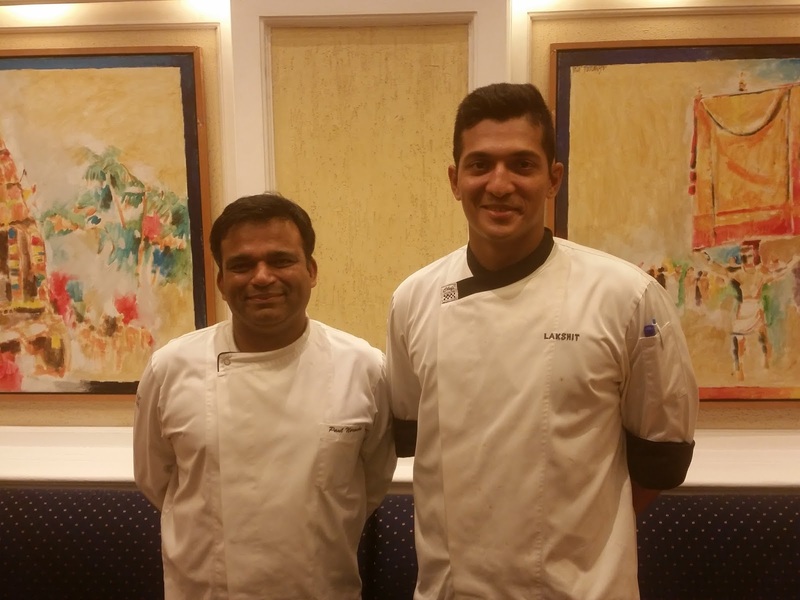 Chef Lakshit explained to us that the cuisine from Mangalore uses a lot of coconut and jaggery thus neutralizing the chillies in the recipes. The cuisine is tasty and flavourful but not too spicy. 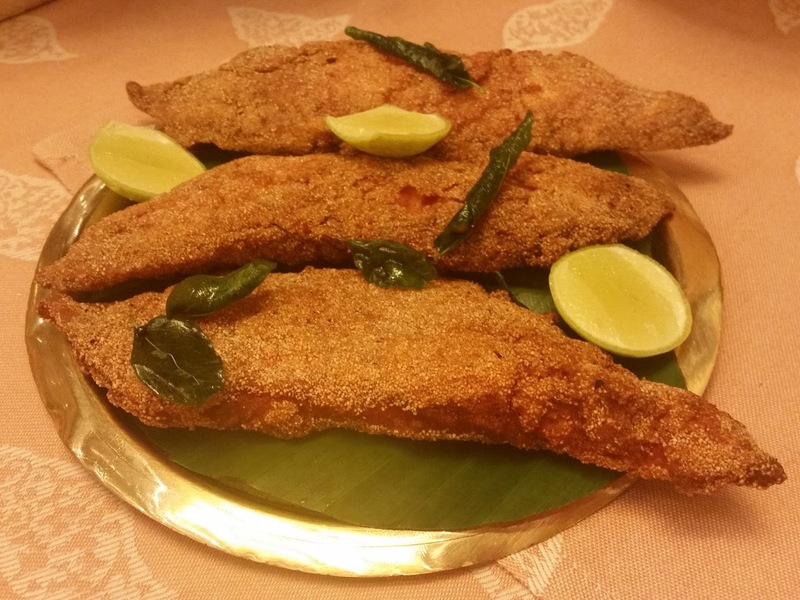 What makes Mangalorean cuisine unique is that it incorporates the preferences of different communities of the region - Saraswat Brahmin, Tulu Bunts, Udupi and Bearies. Also the Byadgi chillies used in Mangalore recipes impart a nice colour to the gravy, and much like their Kashmiri counterpart they are not red hot. We began our meal with Meen Rawa Fry, the signature starter from west coast. The fish fillet which was marinated with red chilli paste and deep fried in a rawa batter was soft and tasty and taken in the marinade well. The vegetarian Badane da Podi was basically batter fried brinjal slices with an awesome spicy podi sprinkled on top. For the festival Chef Lakshit has sourced most of the spices from Mangalore, including those required for this podi. Golli Bajje, a flour based starter (similar to Mysore bajji) had a delightful chutney served with it enhancing its taste. The pick of the starter was the Chicken Ghee Roast, soft chicken fried with ghee and flavourful spices. As usual I went on an overdrive on these, but soon remembered the usual folly I commit of overstuffing on starters and ignoring main courses. So I restrained myself. 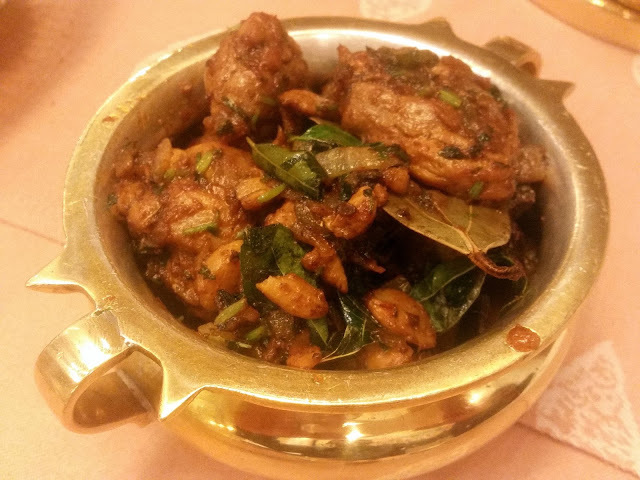 The main course had Kori Gassi, the coconut based chicken curry, which as the festival menu mentioned was ‘the dish that put Mangalore in the culinary map of India’. The gassi or gravy was perfect when poured over Rotti – crispy, wafer thin rice flakes which is to be broken into pieces. 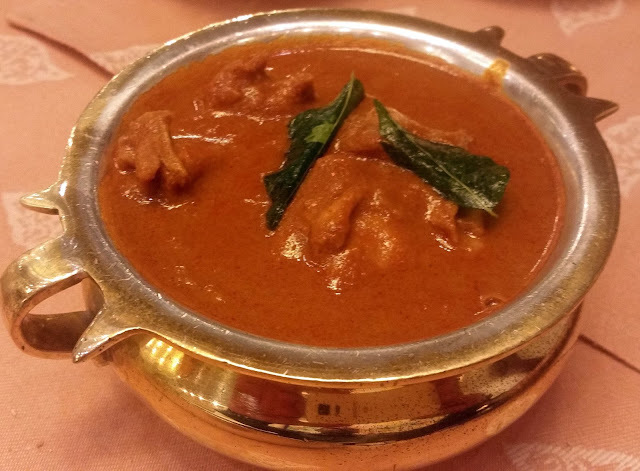 Then there was Massa Ajadina (Mutton Sukka), mutton in a spicy masala of chillies, coriander and coconut. The Kal Dosa was a perfect foil for this. I tried some Kori Gassi with Nei Ta Nuppu, the Mangalore version of ghee rice and the combo came out rather well too. 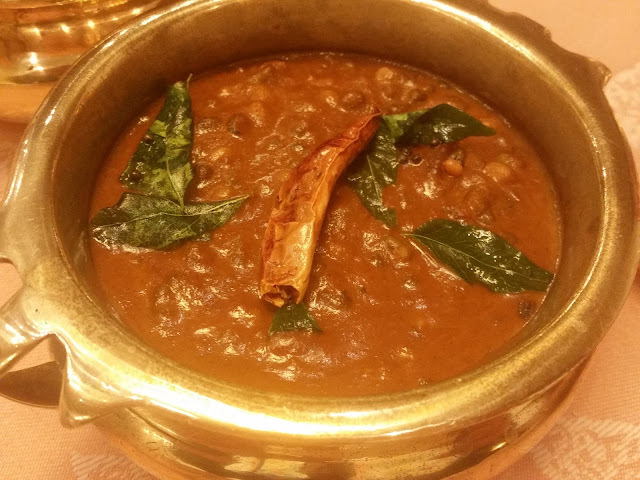 Among the vegetarian dishes, Padengi Gassi had green gram sprouts and potatoes cooked in a silky smooth chilli based gravy. Chef Lakshit told us that this is his favourite dish. 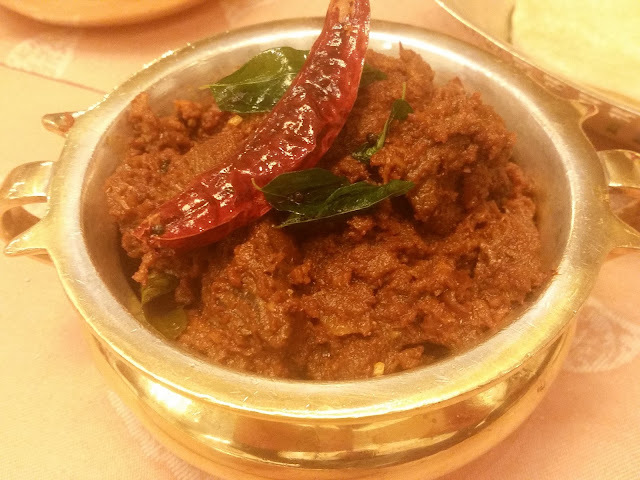 Kadla Manoli Ajadina was a dondakaya (kudru) recipe in chilli and coriander based masala. Chef also mentioned that Ku Kukuda Menaskal, a raw mango and jiggery based special delicacy of the region was also on offer at the festival, though we did not try the dish. The Kori Biryani was actually a pulav which had boneless chicken pieces and spices like mint, coriander and fennel. The biryani to me tasted similar to what we get in Bangalore. Last but not the least Gadbad. 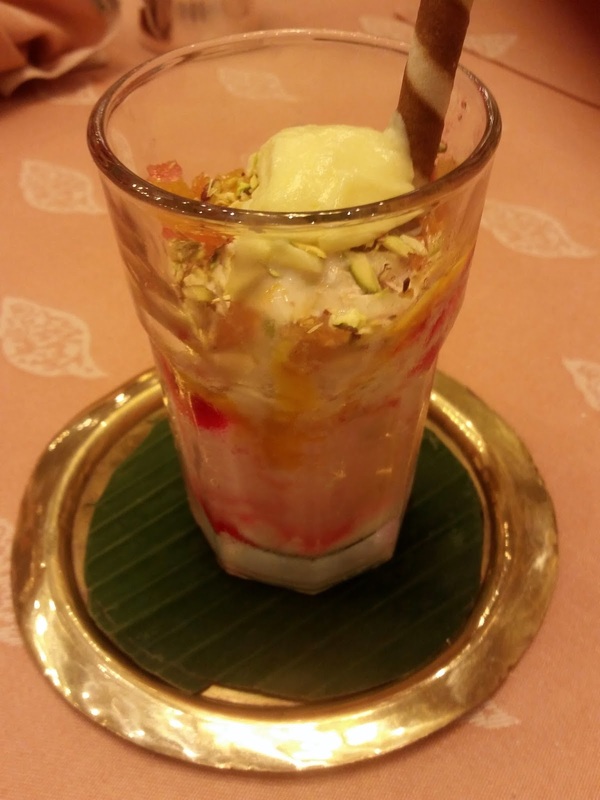 I had tried this ice cream based dessert in Mangalore, and it was love at first bite for me. A combination of ice cream, fruits, jellies and custard served in a large glass this dessert has lot of room for customization, and the one done by the chefs here were absolutely amazing. Chef Paul advised me that the correct way of savouring this was to mix it all up, and this really did wonders combining an array of flavours together. A fitting finale to a grand meal. The menu also had other interesting dishes – two which caught my attention were Tomato Sar (Tempered extract of tomato) and Yetti da Uppad (a tangy prawn gravy). The a-la carte festival is on till September 13th. Food lovers who are fond of trying out new tastes and flavours will enjoy this offering from one of the best chain of South Indian restaurants. Item prices range from Rs 250 to 800.